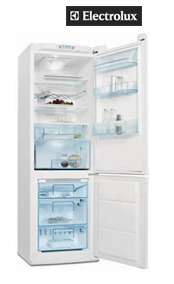 Below you will find a selection of Electrolux Fridge Freezer appliances. Electrolux is a global leader in fridge freezers selling more than 40 million products to customers in 150 countries every year. The Electrolux focus is on innovations that are thoughtfully designed, based on extensive consumer insight, to meet the real needs of consumers and professionals. Electrolux has a wide range of fridges and freezers, in different sizes and with various features to help you relax and worry less about safe food storage or defrosting your freezer less often, or even ever again! Refrigerators equipped with BritaTM filtration system provide filtered and fresh water through the door. A healthy water with an exquisite taste. The unpleasant and regular job of defrosting and cleaning the freezer definitely belongs to the past now, because no ice is created anymore thanks to the Frost Free system.